If you look at any old Hollywood film you’d see they had a standard technique for creating ‘moonlight’. They’d simply shoot in bright sunlight, reduce the exposure and give the picture a blue tinge. The bizarre thing was that it worked – it did give the appearance of ‘night’. Moonlight isn’t actually blue, though. If you take a picture under moonlight with a long enough exposure, you’ll just end up with a picture that looks like it was shot in daylight – the light from the moon is just the same as the light from the sun, just dimmer. However, when you’re out in it, moonlight does actually look blue to the naked eye. And isn’t that what photography is all about, recreating our ‘impression’ of things regardless of how a scientific instrument might record them? 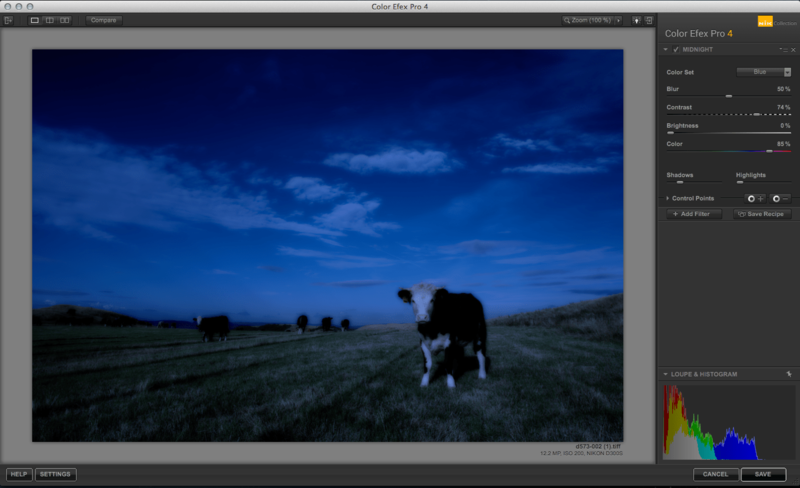 Anyway, the ‘Midnight’ filter in Nik (sorry, ‘Google’) Color Efex Pro 4 recreates the appearance and feel of moonlight, and I’m going to use it on a shot I took a few days ago on a hillside near me in late evening sunlight. 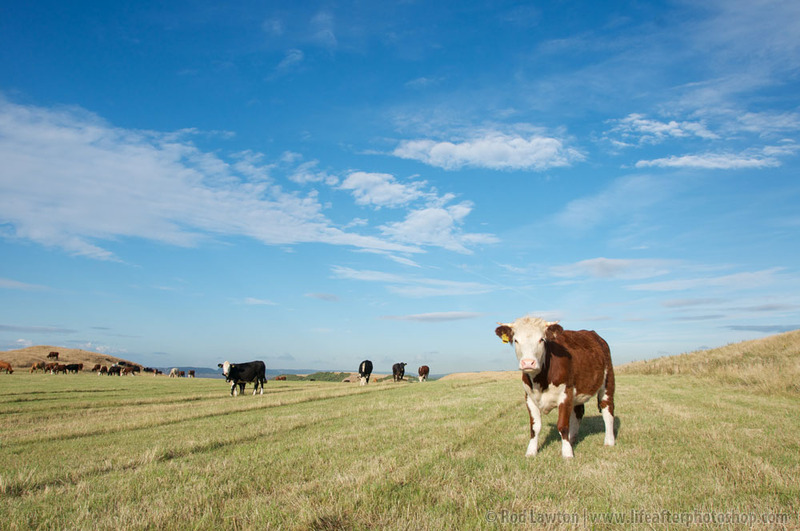 I thought this super-wideangle shot of a herd of cows (including its inquisitive ringleader) would make a surreal and effective composition for my moonlight shot, but it would also be a good chance to show one of the rather clever features in Color Efex Pro 4 – its ‘opacity’ control points. With these, you can remove the effect of the filter in specific areas, and it adds a whole new dimension to the software’s image effects. The Midnight filter has a number of different presets, but this one is closest to my idea of what the picture should look like. It has a blue tinge, increased contrast and a subtle ‘blur’ effect. The problem is, though, that the cow in the foreground isn’t very well defined. Over on the right you’ll see a panel containing the controls for the Midnight filter. And at the bottom, a small section for ‘Control Points’. What you need to do is click on the ‘minus’ control point icon and then click on a part of the picture where you want to remove the filter effect. You can click on any of these screenshots to see a larger version if these details are hard to make out. I’ve clicked on the cow’s nose – you do have to experiment a bit to find the best spot. The control point has two sliders attached – the top one controls the radius of the control point’s effect (its size) while the bottom one controls the opacity. 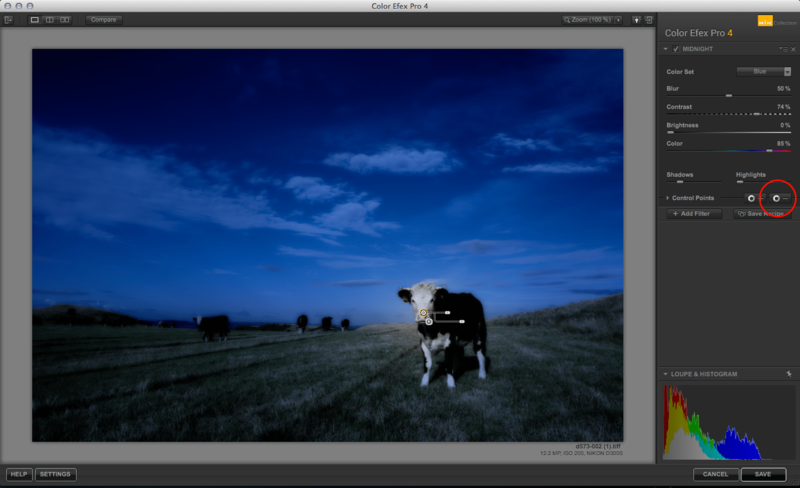 It only takes a few moments to brighten up the cow while leaving the rest of the shot unaltered.